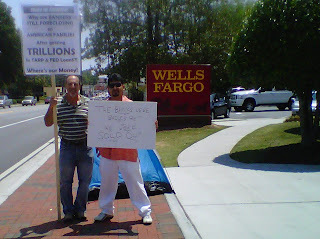 The past week three flash demonstrations were carried out in an effort to keep the pressure on Wells Fargo to make a deal to keep Cobb County resident Steve Boudreaux in his home. So far, despite Steve’s willingness to negotiate a very reasonable deal with Wells Fargo, the bank has been unwilling to budge. It seems they would rather see another crime attracting, neighborhood devaluing, boarded up home is his community. After battling unemployment and struggling to make payments on his mortgage, Boudreaux applied for an emergency home loan modification to stay in his home at a rate he could afford. Boudreaux said everything was all set to move forward until the IRS delayed in getting tax transcripts to his bank. Wells Fargo pushed forward with a foreclosure sale, according to Boudreaux. The transcripts were delivered the day after the foreclosure sale. It’s time the banks stop holding our communities and make an effort to work with home owners to keep them in their home in these historic difficult times. Next Tuesday Occupy Our Homes ATL and the Cobb Coalition For Change will be hosting a national call in day to Wells Fargo in an effort to pressure the bank to make a deal. A Loan Modification is... an excellent way to stop foreclosure for anyone who wants to keep their home and can't afford their mortgage payments.